I have never given LAN much coverage on Head for Points, even though I have written articles covering redemption opportunities with most of the other oneworld partners. I recently helped a friend with some research into Avios redemption options to Chile and I thought it would be useful to share some of the things I discovered. LAN is a long-time member of the oneworld alliance. In 2012 it merged with Brazilian-based airline TAM and the two airlines are now owned by a new holding company, LATAM. The combined group flies to 150 destinations in 22 countries. As well as Chile and Brazil, there are subsidiaries based in Peru, Ecuador, Argentina, Colombia and Paraguay. Chile remains the heart of the LAN business and is where the airline is headquartered and listed. There are no direct flights from the United Kingdom to Santiago in Chile, either with LAN Chile or British Airways. The only direct flights from Europe are from Madrid. The 2nd best option is from Frankfurt. The LAN plane from Madrid carries on to Frankfurt after a short stop – you can even book Madrid to Frankfurt on LAN as a stand-alone Avios redemption if you want a flat bed for that service. I am keen to try this ‘fifth freedom’ flight out one day. Due to the ludicrously over-complicated Avios restructuring recently, it will now take me seven paragraphs to explain how much an Avios redemption from Madrid to Santiago will cost! Using the Avios pricing chart at ba.com, Madrid to Santiago prices out at 180,000 Avios plus £39 in business class. That £39 is not a typo – there are no fuel surcharges to pay on LAN flights. There are 10 flights per week on LAN. Availability seems to be very random – on March 1st, for example, there are six first class seats available on the 20.45 from Santiago to Madrid but none on the 20.20 departure half an hour earlier! There is also a competing daily Iberia service. On an off-peak date, this costs 102,000 Avios + £532 return in business class if booked via ba.com. On a peak date, the cost is 150,000 Avios + £532 via ba.com. If you book at iberia.com, the pricing changes. The LAN flight reprices to 175,000 Avios + US$60 (ie the same £39). However, it is not cancellable if booked via iberia.com so you should use ba.com instead. The Iberia flights become substantially cheaper because the Iberia website does not add fuel surcharges. The cost to Santiago drops to 102,000 Avios + US$214 off-peak and 150,000 Avios + US$214 peak. The LAN flights are still attractive on peak dates. You need 30,000 more Avios but you are saving over £100 in tax. 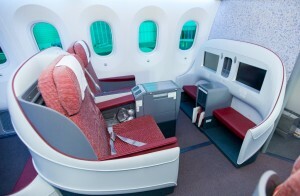 You are also flying on a new Boeing 787 service with the latest LAN business class product. 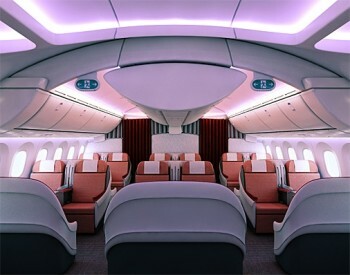 The seating is far more spacious than the Iberia business class cabin. In a future article I will take a look at using LAN for flights to Easter Island and the Galapagos, two of the outstanding but hard to reach tourist destinations they cover. I recently booked 241 LHR/GRU/LHR as I want to go to Peru and visit Machu Picchu in September. I had tied other destinations (Cape Town for example as I go there often) but availability is terrible almost all of the time. So, the options for LIM using 241 most of the way were to fly via MIA connecting with LAN or via Brazil (via GRU – flight durations similar). Availability in anything but Y class were awful via MIA so GRU it is – Premium Economy (744) outbound and Club World (777) inbound. I will then buy a GRU/LIM/CUS/LIM/GRU on LAN but as I need 45 more tier points to get a Bronze card this year, I will pay cash. FYI: from what I could see, availability on 241 to GIG is also quite good generally speaking in all classes. EZE terrible with only a few Y class here and there. so better confirm that you would be getting tier points for Lima – Cusco – Lima flight. This can be interesting (or pretty short :-)). Last time I checked there was absolutely no availability ti Easter Island for months, even up to 1 year in advance. Did not check the entire calendar, but could not find a single seat available. Luckily these flights are available for booking via avios but no point in paying cash for tierpoints/avios. I have personally used paid internal flights in Chile (though not to easter island) on LAN and never got anything in terms of Avios or Tierpoints (not that I was expecting but confirms what the website says). I did get Lounge access and extra bag with Silver card everywhere. Do LAN ever do any good cash deals ex-EU to South America? I was in the Falklands at the end of last year and looked at the MPN flight as a redemption. Given that for cash it is always around £500 return for 1.5hr flight I was amazed to see plenty of availability (always 9 seats) for 4,500 Avios ea way + £0 PUQ – MPN and the same avios but with £17 taxes on the return. Everyone on the islands knew the weekly LAN flight to be very expensive – it would have actually been cheaper to have bought the avios with cash than to pay for the flight itself. In the end I didn’t make it over to Chile but the Falkland’s are definitely worth a visit if you get chance. Cathay Pacific Card (courtesy of AMEX PLAT) gave us Lounge access and free transfers to earlier flights on LAN at times. Very good service and punctuality. Very LOW taxes 🙂 Saved me a ton of money. Availability OK if booking 63 monthsahead. Only IGU-GRU seem to open up about 1 month ahead. Looked at SCL-IPC and availability seems to be 330 days out-for ONE day then disappears. Then there’s the LANBA glitch where no rewards are posted for anwywhere at ALL.! Alternative may be to use SPG points to Tx to LAN and book with their rewards. At least you can see their availability on the LAN site.